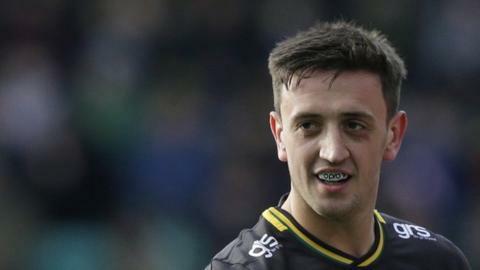 Alex Mitchell ran in a dramatic late try to help Northampton Saints to a narrow victory against Harlequins at The Stoop. Ahsee Tuala sent the visitors ahead when he crossed over early on as Saints edged into the lead in the first half. Jack Clifford's second-half try for Quins levelled the scores before Marcus Smith's penalty edged them ahead. But Mitchell dummied well to go through for a fine solo try in the 79th minute to seal a memorable victory. The result leapfrogged Saints two places into fifth in the Premiership table, a place behind Quins who stay in fourth place. Harlequins came into the game off the back of three league defeats and their task was made harder as they could not find a reply to Tuala's score before the break. Things got worse for Quins on the verge of half-time as Nathan Earle was hauled off on a stretcher after a useful burst to the try-line. In a tense finale at the Stoop, Northampton could have wrapped up victory earlier when Jacobus Reinach ran in at the corner from a Dan Biggar offload, but it was ruled out for a forward pass in the build-up. It was Mitchell's late intervention that gifted Northampton a one-point win as a tight match culminated in a hard-earned win for the visitors. "I think both sides tried really hard to lose that game and fortunately we hung in there for long enough and pinched it at the end. "We had four or five chances in the first half to be well ahead at half-time and took just one of them. "We're very happy to take four points down, that's for sure." Harlequins: Brown; Earle, Alofa, Tapuai, Murley; Smith, Hidalgo-Clyne; Auterac, Crumpton, Sinckler, Symons, Horwill (co-capt), Clifford, Robshaw (co-capt), Dombrandt. Replacements: Ward, Ibuanokpe, Swainston, Glynn, Kunatani, Saunders, Lang, Saili. Northampton: Furbank; Tuala, Hutchinson, Francis, Naiyaravoro; Biggar, Reinach; Van Wyk, Marshall, Hill, Ratuniyarawa, Lawes, Gibson, Wood, Harrison (capt). Replacements: Ma'asi, Waller, Franks, Coles, Onojaife, Mitchell, Grayson, Kellaway.